SEAMEO QITEP in Science is one of the centres under the coordination of the Southeast Asian Ministers of Education Organization that is mandated to implement programmes and activities to meet the needs of improving the quality of teachers and educational personnel in Southeast Asia; and to establish a wide cooperation network for sharing resources, information, and research and development among SEAMEO Member Countries. 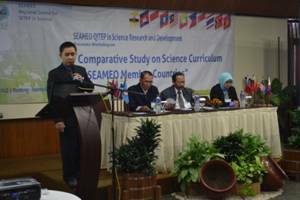 The diversity in the implementation of science curriculum in SEAMEO Member Countries has encouraged SEAMEO QITEP in Science to undertake a study and analyze their similarities and differences from various perspectives. SEAMEO QITEP in Science also takes inspiration from the fact that comprehensive knowledge and understanding of the science curriculum of the SEAMEO Member Countries will strongly support the development of joint programmes and cooperation among the various parties in the region. From 28 to 31 May 2012 in Bandung, Indonesia, the SEAMEO QITEP In Science held the Workshop on Science Curriculum Comparative Study of SEAMEO Member Countries. This is one of the series of research and development programme to improve science literacy in Southeast Asia. In the workshop, participants shared detailed information on the science curriculum development of each member country; as well as the comparative results of the science curriculum implementation study. The study was expected to generate materials for development of science literacy test methods for use in Southeast Asia. Moreover, recommendations on the best model to be adopted for implementation in the SEAMEO Member Countries were also brought about during the workshop. 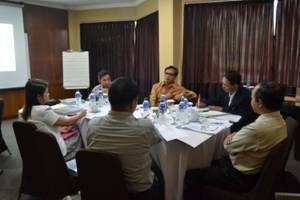 Curriculum developers from the Ministries of Education in SEAMEO Member Countries: namely Brunei Darussalam, Cambodia, Indonesia, Lao PDR, Malaysia, Myanmar, Philippines, and Thailand were among the main participants of the workshop. An expert from the Australian Academy of Science Institutions, Professor Dennis Goodrum, who has been involved in the preparation of the Australian national curriculum, contributed ideas associated to science curriculum. 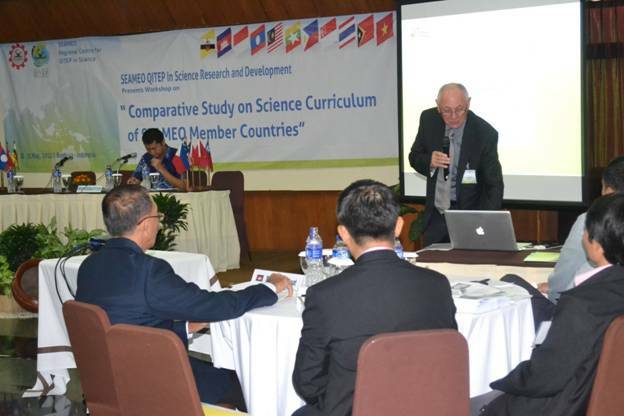 The output from the workshop was the compilation of science curriculum from the 11 SEAMEO Member Countries and the report on the results of the comparative study, including recommendations for science curriculum development for the Member Countries. These outputs will be especially useful for the development of test methods of science literacy in Southeast Asia to ensure more focused and measurable science literacy with a strong foundation on research outcomes and testing. Information on the science curriculum development and comparative results of the science curriculum implementation study were shared during the workshop.